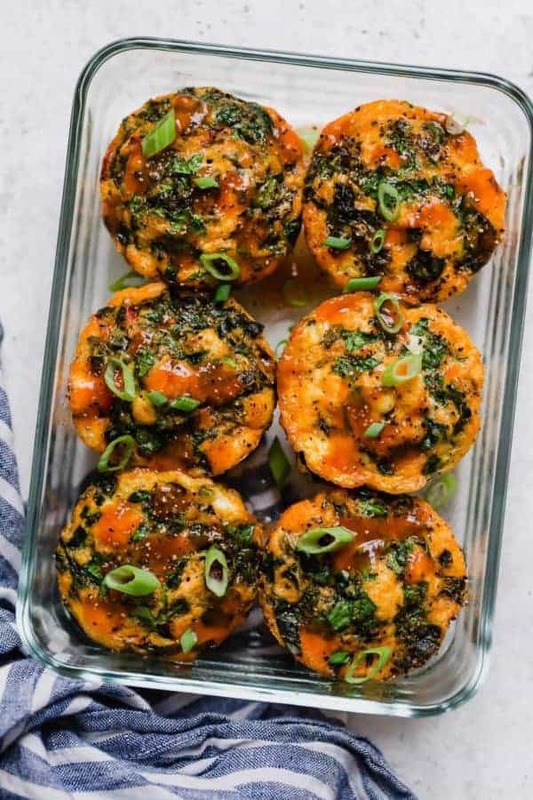 These veggie- and protein-packed Buffalo Chicken Egg Muffins are meal-prep friendly and make for a tasty & easy reheat-and-eat meal. Buffalo-flavored recipes are always a winner. You guys go wild for our buffalo-flavored recipes! In fact, two of our all-time most popular recipes on this blog are Slow Cooker Buffalo Chicken (number 3 spot) and Buffalo Chicken Stuffed Spaghetti Squash (number 4 spot). So that’s exactly why we’re sharing yet another buffalo-flavored recipe with you (and we have another one in the works!). Today, is all about our Buffalo Chicken Egg Muffins! 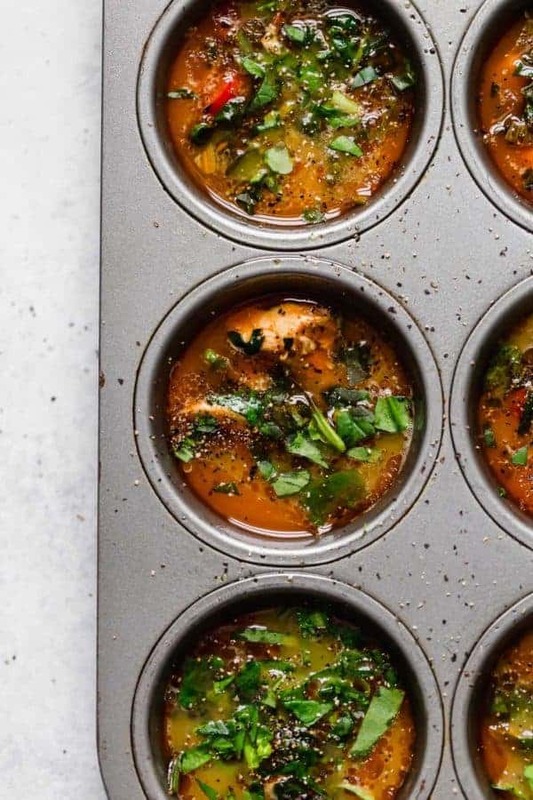 These egg muffins are packed with protein and veggies and that zingy wing flavor you crave. I love prepping this recipe on a Sunday and enjoying as a quick reheat-and-eat meal in the days to come. However, for best taste, I like to enjoy egg muffins within 4 days of making. Made with just a few whole, real food ingredients. As always, we try to keep our recipes to as few ingredient as possible. 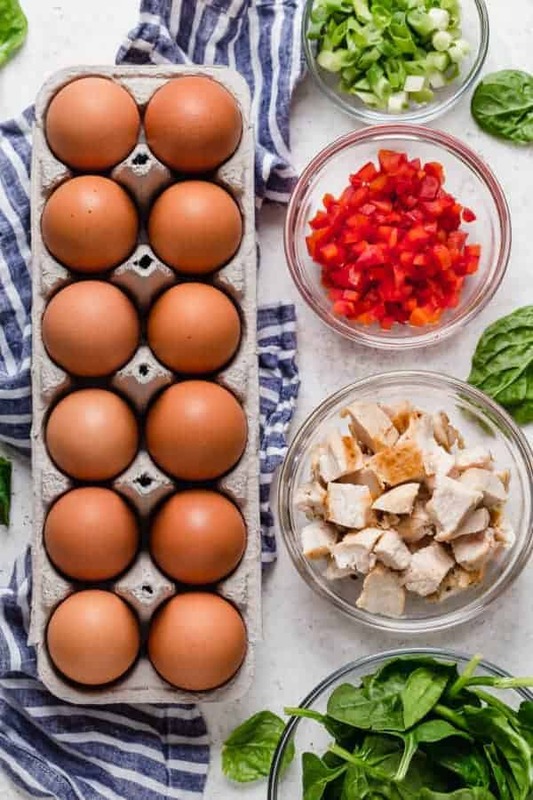 We want to make cooking and eating healthy easy for you by sharing recipes that A) Don’t come with a long list of ingredients and B) Don’t require hours and hours to make. 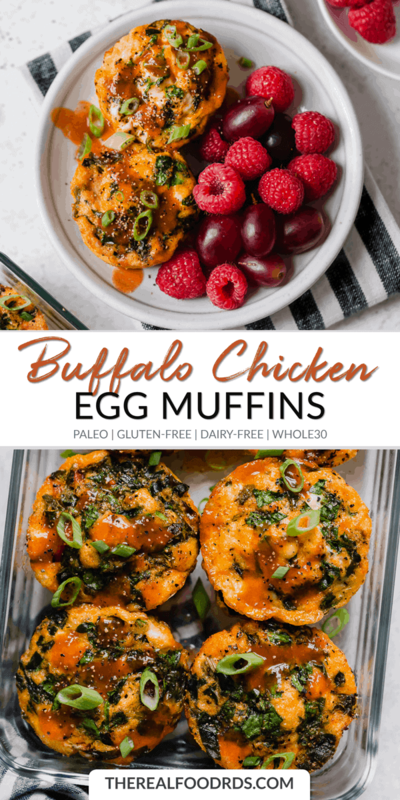 These Buffalo Chicken Egg Muffins are made with just 9 ingredients, which includes the homemade buffalo sauce. You can make your own buffalo sauce or use a pre-made one. Our Homemade Buffalo Sauce is another wildly popular recipe on the blog. It’s included in the recipe below, however, if you have a pre-made buffalo sauce on hand or have one you like, by all means use that and save yourself a few minutes. We love Tessemae’s Buffalo Sauce as well as The New Primal Buffalo Sauce. Both are made with squeaky clean ingredients and super tasty. 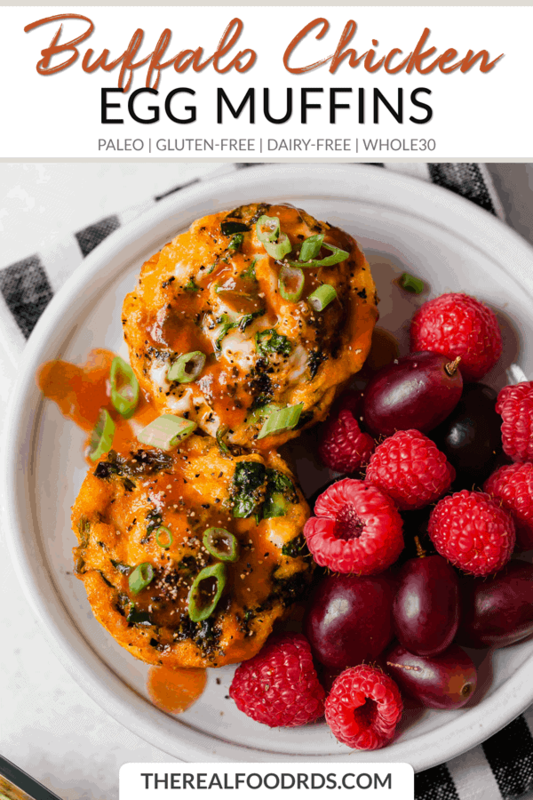 Buffalo Chicken Egg Muffins are Whole30-friendly and dairy-free, but if you like things a little cheesy, feel free to add a little cheese. Cheese makes an ever-so-delicious addition to these Buffalo Chicken Egg Muffins. Whether you love, blue cheese, fresh mozzarella or shredded cheddar, you have options. I like to add about 1/2-3/4 cup of cheese to this recipe. Again, totally optional, but totally scrumptious. 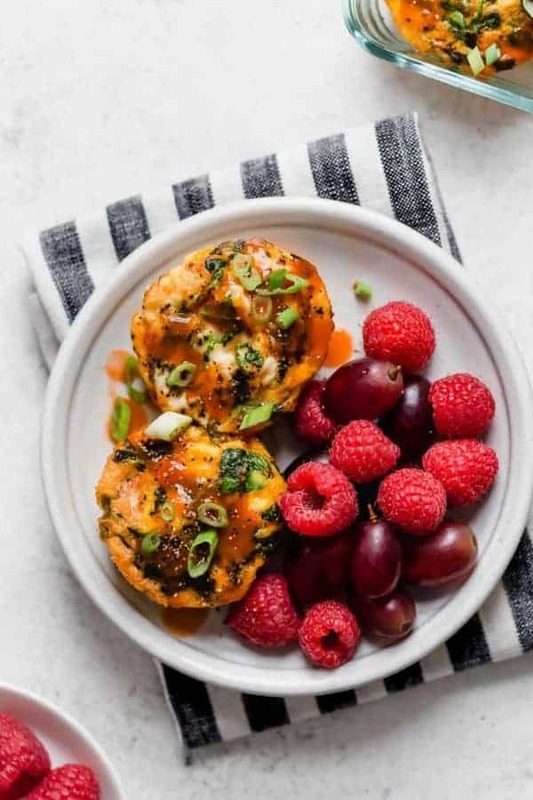 Serve these Buffalo Chicken Egg Muffins with a side of your favorite fruit for a deliciously balanced meal. The flavor you crave – now for breakfast! 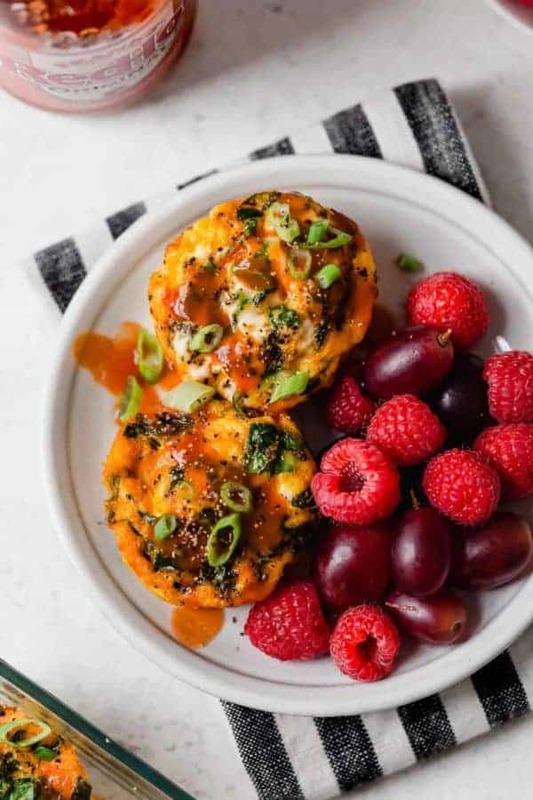 Banish boring breakfasts with these protein- and veggie-packed egg muffins. They’re perfect for mornings on the go when you make them ahead of time. Grease the wells of a 12 cup muffin pan or line with silicone baking cups for the easiest removal. To make buffalo sauce: In a small saucepan, melt 2½ Tbsp. ghee. Whisk in hot sauce, coconut aminos and cayenne pepper until combined. Remove from heat and set aside. In a skillet over medium-high heat, melt remaining ½ Tbsp. ghee. Sauté bell pepper and onions until slightly softened, about 5 minutes. Turn off heat, add spinach, cooked chicken and buffalo sauce to peppers and onions. Stir to combine. 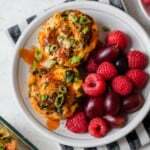 Divide vegetable and chicken mixture evenly among wells of the muffin pan. In a bowl, beat eggs with salt and pepper. Pour over vegetable mixture. Bake at 350°F for 18-20 minutes until eggs are set and a toothpick inserted in the center comes out clean. What’s your favorite breakfast? We’d love to hear what’s on your plate in the comments below! What is coconut a amino n where can u get it?…want to try these. Is there a substitute for that? Coconut aminos are a fermented condiment much like soy sauce (only made without soy or wheat and lower in sodium). You can find them in well-stocked grocery stores, health food stores, Trader Joe’s and online at places such as Amazon and Thrive Market. If you’re not worried about the soy, gluten-free tamari sauce can be used in place of the coconut aminos (you may need to taste as you go to be sure the dish doesn’t get too salty as tamari is often saltier than coconut aminos). Can you confirm the recipe is only supposed to make six as it states? I was a bit confused because it says “yields 6” but then also says to grease the wells of a muffin tin. We doubled it based off the yield of 6 and placed all our chicken in the 12 muffin tins only to find out we had extra eggs.. half of what we started with. Based on this I would assume the recipe should yield 12.. but want to confirm to see if we went wrong somewhere. 2 muffins = a serving. So this recipe would make 12 muffins (6 servings). I’ll update the recipe to make that more clear. Thanks! If using pre-made buffalo sauce how much total would you use? I would guess about 1/3 of a cup. I’m excited to try these! We are buffalo obsessed over here! If using a pre-made buffalo sauce what would the measurement be? Thanks for all the great recipes!